Looking for a class that provides you with the many benefits of a traditional yoga class in a gentler format? Chair yoga could be just what you are looking for! Chair Yoga is just like other forms of traditional yoga classes except poses are modified and done solely on a chair. It can be accessible for everyone, especially those that have mobility issues and find it difficult to go from a standing to supine position. 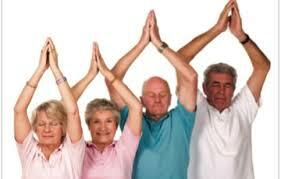 Chair Yoga is a class ideal for beginners, older adults or anyone that has mobility problems. All exercises and poses are versions of hip stretching, forward bends and twisting that are done in more traditional yoga classes. Not only does Chair Yoga provide a great stretch, increased strength and balance, but there are many other health benefits including reduction of stress, better sleep and a sense of well-being. With regular attendance to a Chair Yoga class you will find improved range of motion, balance and strength. So many benefits for body and mind! Janice is now offering a chair yoga class at Lifestyles on Wednesdays at 11 AM. Come and give this class a try and see if it is a good fit for you!